Hi everyone. Second post for today ... that hasn't happened for a while! Just couldn't resist playing along with SCS Ways To Use It Challenge (WT432 - vellum). Haven't used vellum for such a long time ... or brayered either, but when I saw a card done by Shana Gaff where she brayered the vellum - wow!!! Had to give it a try. Thanks for inspiring Shana! Used the colours from the Colours & Sketches Challenge #30 - colours: cajun craze, gumball green, primrose petals). 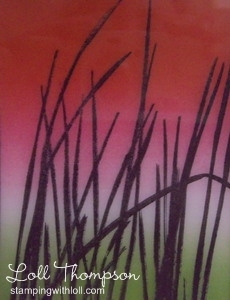 Three very bold and saturated colours - but they worked perfectly for this brayered background - love them together! I brayered the vellum with the three colours ... green ink on the bottom, primrose petals ink from the top all the way down to just above the green (leaving a small white space) and then cajun craze ink on top of the pink at the top only. I used my stamp-a-ma-jig for placement of the grasses and stamped in black ink. I used my heat tool to dry the vellum (being careful not to over-heat). I found that the ink still smudged when I handled it, so decided to place an acetate sheet over the front to protect the ink. I framed the brayered vellum and acetate sheet between two layers of white cardstock, both with the rectangle die-cut from the center. Then I popped the card front on top of my card base. Love how it turned out! If this link doesn't work, do Youtube, Scrap Made Simple, and video #73...I think you'll enjoy what she does..the vellum is towards the end. Two great cards, you were busy! Loved them both and Congratulations to Mary! I know she will have some fun. I love my flowers and I don't want to use them, they are too pretty! OH Loll, I have got to try this, looks so soft and pretty, your card is so pretty, and kudos to you, two in one day, I did get one done will post it tomorrow, already gave it away to one of the teachers at our local store, they had a mini party tonight, she was the teacher of a class once a month for a class that I went to for the last year or two, she would teach a new technique or product each month, and then you got home work to do. Anyway, the class's have now ended and she had a party, so I made her a card and forgot to take a picture of it, so I will re make the card first thing in the am, still have some extra pieces from the other one I made, tried to keep it simple. Anyway, when I get done doing that , will have to try this, I love the look. Thanks for sharing, and the passed on inspiration!! This is so beautiful! I love the colours and you have inspired me to try this technique! This is a gorgeous card. I am always envious of people who do great brayering (I'm not so good at it) and it looks amazing on vellum, you've inspired me to have a go! Stunning Loll.....tfs your detailed instructions. I definitely want to try. This is absolutely gorgeous Loll. It's stunning in it's simplicity. I have done quite a lot of brayering but never thought to try it on vellum. Inspired to have a go..........so thanks to Shana for inspiring you! I have never brayered anything. The brayer is one of those NBUS thingies. Thanks for explaining how you did this. I might just give it a try! It made another beautiful card! Very serene and peaceful. Must try this!! Absolutely gorgeous. Very peaceful - could just sit and stare at it for quite some time. A true work of art dear Loll. Stunning, Loll! love this. So elegant. Love, love, love this take on the colors - absolutely beautiful! Thank you for joining us at CAS Colours & Sketches! This turned out fabulously! I love the look of the brayered vellum. 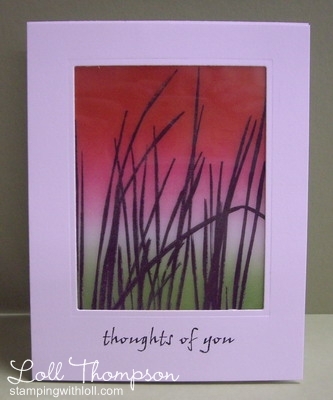 I'm so glad you shared your card with us in this week's challenge at CAS Colours & Sketches! Loll, have not seen you post in a bit, miss you, hope all is well, take care and again, hope you are ok and doing something enjoyable.